Delicately perfumed with citrus scented Verbena, L'Occitane Verbena Wipes cleanse and perfume hand and body wherever you are and whenever you need. Easy to carry, these refreshing towelettes can be used all day long and are ideal for travel. 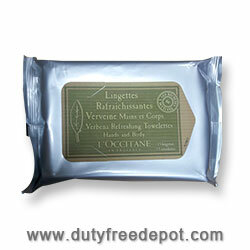 In addition, you can use L'Occitane Verbena Wipes without damaging the environment as they are 100% biodegradable.